As I approached my 39th birthday last year, I decided I should take better care of myself. I didn’t really diet, I just started being more active. I started swimming, walking and working out occasionally. One year and 65 pounds later, I feel better. I also have more energy than I did before. I am beginning to think all the exercise gurus might be on to something. Mesothelioma patients can also tap into the benefits of exercise and a healthier lifestyle. The trouble with benefitting from fitness training is that some cancer patients may not feel up to a strenuous workout. If that’s the case, there are many different types of physical activities that might be a better fit than the more traditional gym workouts. Back when I was comfortable with my sedentary lifestyle, I felt tired all of the time. I couldn’t visualize myself willingly adding to my long, daily to-do list. My workday, managing my home and parenting my kids was all I thought I could handle. Ironically, overcoming fatigue is one of the many health benefits of being more active. Mesothelioma patients often experience fatigue, especially during chemotherapy and radiation treatments. However, incorporating just a little physical activity into a daily routine has many benefits and can increase a cancer patient’s quality of life. Exercising can improve the mental and physical health of people living with mesothelioma. Patients and caregivers should consult their oncology team when designing an exercise plan. Doctors and their patients can explore many low-impact, strength-training programs to find the right fit. When considering various physical activities, people may overlook exercise programs that aren’t always found in the gym such as yoga, walking and even swimming. Just because it doesn’t involve free weights or a fitness trainer, doesn’t mean it isn’t beneficial. An article published in Strength and Conditioning Journal illustrates the many health benefits patients with breast cancer experience through swimming. According to the article, many oncology professionals are moving away from the outdated “chemotherapy and bed rest” approach to cancer treatment. My father purchased his dream home in 1989. His criteria was a fireplace and a swimming pool. Dad always enjoyed swimming, and after doctors diagnosed him with stage IV mesothelioma, that didn’t change much. Our oncologist told us that swimming could help increase Dad’s stamina and range of motion. Just like breast cancer patients, my father’s health improved with swimming. Dad loved having friends and family over to swim. He hosted pool parties throughout the summer of 1993. Swimming provided a way for him to maintain his physical health and his mental well-being. Dad lounged by the pool, socializing with friends and family part of the time. And when he felt up to it, he’d swim a few laps. My father felt better when he was able to be more physically active. When we discussed pool parties with Dad’s oncology team, doctors touted the physical benefits of swimming, but also shared a few words of caution with my family regarding their concerns about Dad’s immune system. Dad was careful to follow the doctors’ swimming guidelines. Most cancer patients and their families understand the impact of cancer treatments on the human body. Chemotherapy and radiation treatments pack a punch for treating cancer, but also have numerous side effects. Among the side effects of treatment are fatigue, hair loss, skin irritations and a weakened immune system. Sometimes, treatment side effects can interfere with patients’ swimming safety. Skin Irritation: Some cancer patients experience skin irritations or have especially sensitive skin following treatment. Swimming in chlorinated pools or excessive sun exposure can make already irritated skin even worse. Be sure to check with the oncologist about potential skin problems before entering the water. Immune Deficiency: Cancer treatments can weaken patients’ immune systems by lowering blood counts. Swimming in a crowded public pool can increase exposure to germs. Similarly, swimming in lakes, ponds, creeks or the ocean increases one’s risk of germ exposure. It is essential to check with the oncology team to know what swimming environment is safest for you. Cancer patients undergoing treatment may not feel as though an exercise plan is realistic for them. It might be difficult to envision a physical fitness regimen when feeling fatigued from chemotherapy treatments. Oncologists, caregivers and patients can work together to design a realistic plan that is beneficial and approachable. 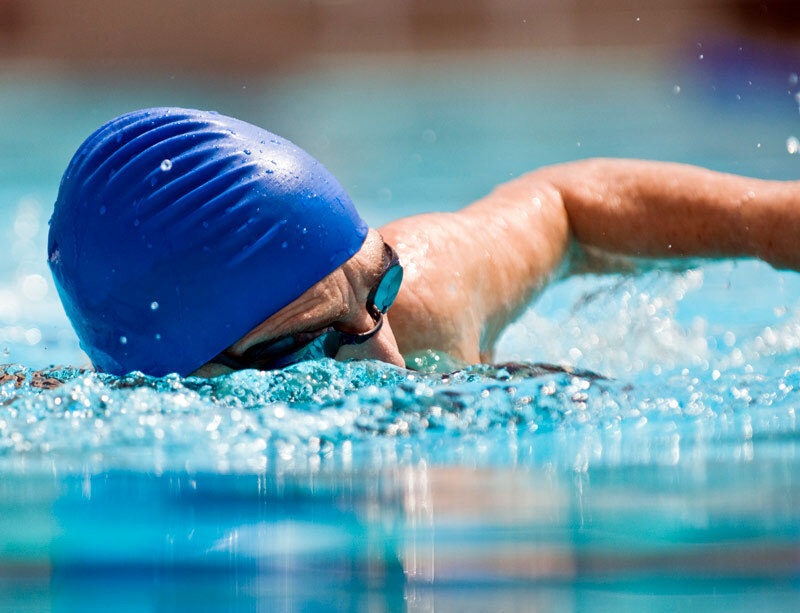 Swimming provides a fun and social way to incorporate physical fitness into cancer care. Water reduces the impact of exercise on stiff joints and sore muscles while providing enough resistance to build muscle strength. Maintaining range of motion, muscle tone, flexibility and stamina are vital aspects of physical health that are essential in preserving cancer patients’ quality of life.